Moving Guru » Moving Guide » What Are Flat Rate Moving Companies? What Are Flat Rate Moving Companies? Do you have a lot of stuff to move? Then a flat-rate moving company is probably best for you. Flat rate movers charge you one over-all price for your entire move. So, if the move takes longer than expected; if your grand piano is too heavy to lift; if movers need to use the stairs because the elevator broke, it’s no additional cost to you. Flat rate fees are designed to accommodate some risk to the moving company. This means they are usually a bit higher than necessary. For example, under an hourly rate, if everything goes right, movers might be able to pack up your house for $1,000. The flat rate fee, however, could be $1,200, which assumes that the move won’t go perfectly. Amount of stuff – If you have a four bedroom house filled with stuff, a flat rate is probably a good call. Difficult things to move – If you have a piano, a large sofa, and a pool table, a flat rate is probably better than hourly, because those things will take serious time to move. Accessibility – If movers can’t easily get in and out of your home, or if they have to park their moving truck at the end of a long pathway or at the bottom of some stairs, the time it’ll take for them to move your stuff will increase. Not all companies offer flat rate services, and some might only offer them in certain situations. 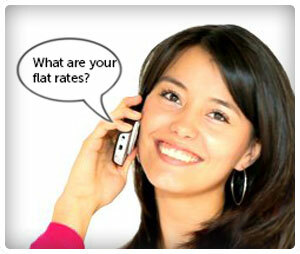 The only way to find out whether a company can offer you a flat rate is to call. When calling, your goal is to get the lowest flat rate possible. This requires selling your move as easy, quick and not risky. Don’t lie, as that can lead to losing your contract with the company; however, try to describe any difficulty like it’s a piece of cake. The staircase? It’s as wide as a highway. The piano? It has wheels. Talk with a few moving companies, and don’t be afraid to ask them about how they decide their flat rate quotes. After you get a few different quotes, you’ll probably be able to make a safe choice. If a flat-rate company sounds too expensive for you, perhaps a You-Pack moving company would raise the right price.